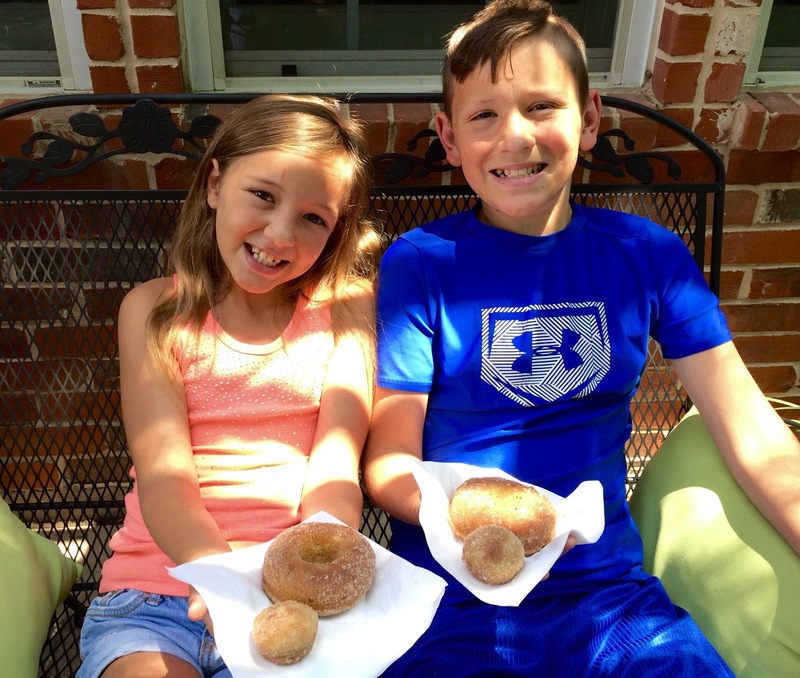 School is out and we had our first Cooking Camp by making Snickerdoodle Donuts and Donut Hole Muffins. If you don't have a donut pan or mini muffin pan, no problem! Just use a regular muffin pan and bake the muffins a little longer. 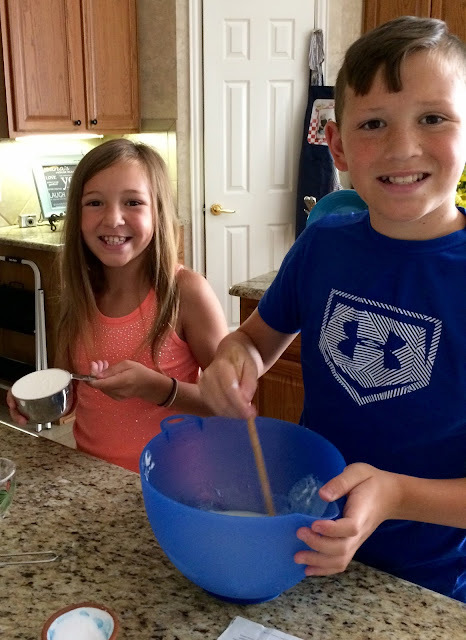 Look at these cute grandkids, who are brother and sister, enjoying some baking time in Nana's kitchen. They are enjoying their baking accomplishments and even had some to take home to their family. These were a big hit at our first Cooking Camp! I had so much of the sugar coating leftover that I cut that part in half for an improvement to the recipe, and for less waste, for when I make another time, and there will be another time...these were so tasty!! Preheat oven to 350 degrees. Lightly grease a 24 cup miniature muffin pan, or a 12 cup regular muffin pan. Be sure to spray the pans over the kitchen sink! Stir together sour cream, oil, egg, vanilla, and 1/2 cup sugar. Whisk together the flour, baking soda, salt, cinnamon, and nutmeg in a medium bowl. Whisk sour cream mixture into the flour mixture. Spoon 1 tablespoon batter (we used a small cookie scoop) into prepared pan, keeping batter rounded on top. Bake in a preheated oven until golden and springy when lightly touched on top, about 10-12 minutes. Cool in pan for 5 minutes. Remove from pan to a wire rack; cool completely, about 15 minutes. Prepare the coating: Place melted butter in a small bowl. Whisk together the sugar, and the spices in another small bowl. Dip each muffin in butter; immediately dredge in sugar mixture, and place on a serving platter. Kitty, I poured my coffee before coming here knowing you would have something sweet for me to eat with my coffee. I enjoyed your First Cooking Camp and look forward to your summer of treats and sweet grandchildren. Golly and I even have a donut pan. The grands sure look pleased with the results. My grands no longer enjoy time spent in the kitchen. I am more likely to find them playing wiffle ball under the trees. They still enjoy eating, though. Ooh, I think Mr. P. would enjoy those snickerdoodle treats! Those kids are the best, Kitty! Well, I just may have to do these with my oldest grans. They look so delicious! Thanks so much for sharing! Awesome! You're making good use of that donut pan. These bites look so inviting. I would love a couple...no doubt the children enjoyed them. So happy you're making memories with those adorable grandchildren. Thanks for sharing and have a beautiful week. Love and hugs! OH.YUM! It's probably a good thing we are not next door neighbors (but it sure would be fun) because if I was, I wouldn't be able to get through my front door! Or the back door either...lol! Darling colorful vignette showcasing your baking. The kids look so cute too. I know they are enjoying their summer out of school. Oh wow Kitty these look and sound so yummy! The kids are lucky to get baking lessons from you! 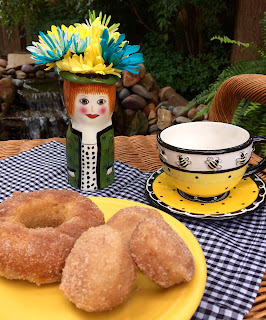 Catching up on posts and I could sure go for one of these donuts with tea. Cooking/baking school is in for the summer? Hi Kitty, what a fun first cooking camp of the summer and special recipe for the kick off. This looks so delicious and those smiling grands are adorable!!! Thanks for sharing this recipe. Enjoy the week and stay cool!! It sure got hot didn't it?? 100's are on the way. You my dear are NOT helping me stick to a diet haha! Those kids are so lucky to have you -- what fun memories you are creating! These look delicious!Your grands are so cute!Hugs! Oh, look at those sweet faces! That little gal looks like her Nana. Oh my, I could sure go for one of those donuts! I have made snickerdoodle cookies before but not the donuts or muffins. Yum! Yum! Soon I may be able to enjoy a treat such as these. Your cooking camp is such a fun place to be. That is so wonderful! Such darling kids and so eager to learn - that's a blessing! Thanks for sharing your "donut time"! I can almost smell these! Sounds so delicious. Thank you for sharing! I'm sure the kids are glad it's summer:@) Donuts sound really good! Kitty, those sound delightful! Can you send the grands over to make a batch with me?! Oh yummy! I love Snickerdoodles, so I know I would love these. The kids are so cute!! Thanks for sharing with SYC. Aww Nana's kitchen is at it again. Those sweet faces are having a blast. I could use one of those snickerdoodle donut hole muffins now. Happy summer Kitty. 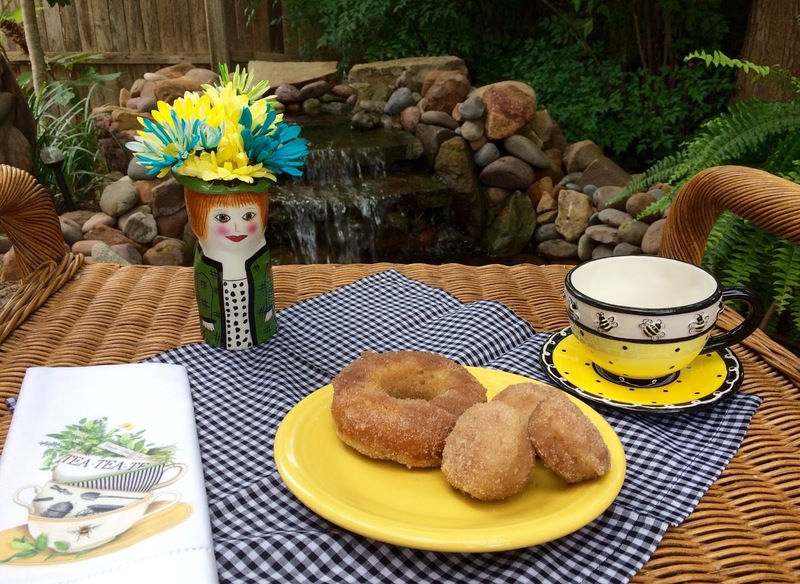 Love your cooking camp and those donuts look amazing! Thanks so much for sharing your post with us at Full Plate Thursday. Have a great weekend and come back to see us real soon!